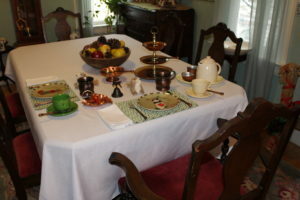 In last week’s Tuesday Table Setting blog, I mentioned that I had created three different table settings centered around my Homespun Holidays Christmas theme in the Dining Room in 2015. Here is a quaint tea-for-two, using the other two Stocking Cat plates that were not in the tea-for-six setting. I also reversed the wonderful hand-woven placemats made in Wales, and they go perfect with the cheery plates. I changed up the water glasses and used copper mugs made in Butte in their place (one a gift and the other purchased at the Berkley Pit gift shop in Butte, Montana), and added a beautiful copper serving bowl (thrift store), and salt and pepper shaker set (thrift store) on a hand-made copper leaf platter (thrift store). Fiesta tea cups and saucers in Shamrock and Ivory (Herberger’s) round out the perfect table setting. Next week’s posting will be a dinner for six-keep reading!